Tyrol (Tirol), one of the strongest centers of Anabaptism during the 16th century and a fountainhead of great leaders of the movement. After the establishment of the Hutterite brotherhood in Moravia practically all Tirolean Anabaptists turned Hutterite, with the exception of a few individuals who followed Pilgram Marpeck. 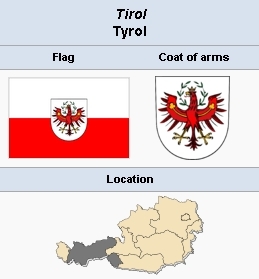 Tyrol, a province of Austria, named after the Counts of Tyrol (near Meran), came into the possession of the Hapsburgs (of Vienna) ca. 1360. Its population is German except for the area of the bishopric of Trent where the population is Italian (no Anabaptists lived there). In 1918 South Tyrol, i.e., the part of Tyrol situated south of the Brenner Pass, was ceded to Italy. Tyrol is a mountainous area and the people are sturdy, forceful, and proud of their "liberties." The seat of the provincial government is the city of Innsbruck, situated at the point where the east-west road along the Inn Valley crosses the north-south road over the Brenner Pass, the lowest (4,000 ft.) pass over the Alps. The Inn River flows into Bavaria (border town Kufstein), thence into the Danube at Passau. The main sections of Tyrol are the valleys of the Inn, the Eisack, and Adige rivers, and several bishoprics. (1) The Inn Valley, with the cities Innsbruck, Hall, Schwaz, Rattenberg, and Kufstein, is rich in ores; its miners represented the most alert social element of Tyrol at that time. The old road from Germany to Italy leads through this valley, making it economically well situated and progressive. (2) The Eisack Valley, south of the Brenner Pass, near the bishop's seat at Brixen, is soon joined by the Puster Valley, the home of Jakob Hutter and Jörg Zaunring. The towns of the Eisack Valley are Klausen and Guffidaun, where Jörg Blaurock found his martyr's death in 1529. (3) The Adige Valley (German, Etschtal) extends through Meran and Bozen down to the border of Italian-speaking Trent. (4) The area of a number of bishoprics such as Brixen, Salzburg — Kitzbühel belonged to this bishopric — and Freising (from Rattenburg to Kufstein). In all these ecclesiastical domains the Hapsburg government had less to say and little executive power, although pressure was always exerted. There is insufficient source material to decide precisely how or when Anabaptism reached Tyrol. Very little is known for the time prior to 1527. As everywhere else in German lands, Tyrol also experienced a peasant revolt in 1525, under the leadership of a certain Geismaier, which though partly political and economic, was no less a revolt against a decaying Catholicism and a cry for spiritual renewal. Strangely enough, Lutheranism did not have the same appeal here that it had in Germany proper. The first reliable information concerning Anabaptist mission work dates from November 1527. At that time both Leonhard Schiemer and Hans Schlaffer had entered the Inn Valley from Bavaria. Schiemer was caught at Rattenberg and suffered the first recorded death as a martyr in Tyrol in January 1528. Schlaffer was caught about the same time nearby in the mining city of Schwaz, where it was said that of 1,200 inhabitants 800 were Anabaptists, and was put to death in February 1528. These two executions began the sad spectacle of relentless hunting, torturing, and killing of Anabaptists, which lasted almost to the end of the 16th century. It was carried out mainly upon the stern command of Ferdinand of Hapsburg, living in Vienna, who never wearied of insisting upon the harshest measures. But in spite of the pyres and burning fagots all along the Inn Valley Anabaptism only took deeper roots. One chronicler reports one thousand executions up to 1530, although the records of 1539 account for hardly more than 600, and the Hutterite chronicle speaks of "only" 386 executions up to 1542. Whichever figure is correct, the challenge was severe, but the undaunted spirit of this sturdy mountain folk was ready to meet it. Not Lutheranism but Anabaptism became the answer to the ills of the Catholic Church, from 1527 to 1627. The sharpest of all the numerous mandates issued by Ferdinand against the Anabaptists was that of 20 August 1527, proclaimed in Tyrol on 20 November of that year. No fewer than 1,200 copies were taken to Innsbruck to be distributed among the clergy and city and county authorities, and to be announced everywhere from pulpits and market places. Actually, however, it had no deterrent effect; judges and jury often felt compassion for the humble victims and hesitated to comply with the orders from Vienna or Innsbruck; only the threat that all sympathizers and Half-Anabaptists would be dealt with like Anabaptists achieved the desired effect. That so many Anabaptists escaped the vigilance of the authorities and traveled safely to the "promised land" of Moravia, and that so many missionaries from Switzerland, Bavaria, and Moravia worked here at least for the first 50 to 60 years, holding meetings and building up congregations, proves that no government action could quench the spiritual fire and the serious determination of the population. It was not until the end of the Council of Trent (1563, see Counter Reformation) and the internal reforms of the Roman Catholic Church, together with the coming of the Jesuits, that the vigor of the Anabaptist movement was broken. In 1527 Schiemer and Schlaffer had come to the Inn Valley from Bavaria, spreading the teachings which they had received from Hans Hut. In May 1529 Jörg Blaurock, who was a refugee from Switzerland, was working ceaselessly in the Adige and Eisack valleys, apparently most successfully. When he was finally caught and executed in Guffidaun near Klausen, 6 September 1529, a young boy of eight was watching this weird spectacle: Peter Walpot, the later outstanding bishop of the Hutterites in Moravia. It is possible that Jakob Hutter received his first news of the Anabaptist movement from some brethren in Carinthia, just east of the Puster Valley. That is about all that is known of outside influences in Tyrol. For the greater part Tirolean Anabaptism was an indigenous product. Pilgram Marpeck (formerly a Lutheran of Rattenberg) was also converted ca. 1527, and likewise Leopold Scharnschlager, a native of Hopfgarten near Kitzbühel. Members of the Tyrolean nobility also now and then turned Anabaptist. Among them were Helene von Freyberg, mistress of Münichau castle near Kitzbühel, who gave asylum to many an Anabaptist (she was one of the few followers of Pilgram Marpeck); Erhard Zimmermann, the former administrator of Neuhaus; Agnes von Waltenhofen (nee Trautmannsdorf); Christopher Fuchs, captain of the border castle of Kufstein; and Anton and Siegmund Wolkenstein, who belonged to one of the oldest and most highly respected noble families of southern Tyrol. Only a recantation at the last moment saved the Wolkenstein brothers from a martyr's death. Helene von Freyberg, however, had to leave the country, bequeathing her estate to her sons. Johann Loserth published in 1892-93 an almost exhaustive account of Anabaptism in Tyrol. Recent research by several Innsbruck historians (e.g., Widmoser, Kolb) has added little to the established facts. Widmoser, who in 1951 summarized all this research, comes to the conclusion that Tyrol must have produced close to 20,000 Anabaptists during the 16th century (with more than 600 executions all told). Although Widmoser clearly takes the traditional anti-Anabaptist position he has had to admit "that one cannot help getting the impression that the government intentionally exaggerated the danger and perniciousness of Anabaptism in order to get a legal title for its ulterior purpose: the dominance of the state over the church." Previously Widmoser had expressly stated that the persecution was carried out mainly by the Hapsburgs, while the ecclesiastical princes (Brixen, Salzburg, Freising) prior to the Council of Trent (1563) had little power to parallel these activities. Widmoser reveals another motive for the severe persecution, far removed from all spiritual concerns; viz., that Ferdinand needed for his Turkish Wars the money accruing from the confiscation of Anabaptist property. Loserth reports of one peasant who sold his homestead for 1,600 guilders, and another Anabaptist left property behind valued at 12,000 guilders (1555). Ferdinand was absolutely ruthless. All kinds of tricks were improvised to ferret out the Anabaptists. Special "Anabaptist hunters" (Täuferjäger) were organized, and spies appointed to report on secret meetings. The reward for the capture of an Anabaptist, originally 20-40 guilders, was raised to 60-70 guilders, even to 100 in case of a leader. And finally the most severe of all deterrents was applied, the sentencing of these "obstinate heretics" to the galleys of Andrea Doria of Genoa, imperial captain of a navy in the Mediterranean. But this most inhuman measure was even less effective than the pyres of the Inn Valley. Ferdinand attended to every minute detail in the fight against Anabaptism; every case had to be reported to him personally in detail, and the archives of Tyrol and Vienna are full of mandates and correspondence in these matters. Hesitant courts were reprimanded and vigilant officials were praised whenever a big catch succeeded. He even prescribed that in case of recantation the offender should be "only" beheaded. Nevertheless the authorities in the various court districts frequently aided the Anabaptists in their flight to Moravia. Since the majority used the waterway down the Inn, a supervision of the boat traffic was enjoined by the king, but in the great majority of cases the emigration nevertheless succeeded. Two government officials deserve special mention, one more bent on the method of persuasion, the other more on persecution. Dr. Gallus Müller, Catholic court chaplain in Innsbruck, realizing the shortcomings of his church and having attended a provincial synod at Salzburg in 1537, hoped to exterminate the "error of heresy" by internal improvement, which, however, was never carried out. His work with the imprisoned Anabaptists Leonhard Lochmaier, and Georg Liebich and Ursula Hellriegel is discussed in the pertinent articles in this encyclopedia. No real communication could be achieved between the victims and this Catholic theologian. Soon Dr. Müller changed his mind and aided in drawing up the mandate of November 1539, which calls the Anabaptists not only "falsifiers of the Scriptures" but also outright revolutionaries. At the same time the notorious Wolfgang Künigl, imperial court prosecutor and specialist in Anabaptist hunting in Lower and Upper Austria in 1527-28, was sent by Ferdinand to Brixen to consult with the prince-bishop as to the best method of halting this "heresy." The result of this conference was a memorandum to the king, dated 17 October 1539, entitled, Anzaigungen, aus was Ursachen die Wiedertauffer in disem Lande der Fürstlichen Grafschaft Tyroll Iren Fuss dermassen gesetzt und bishero über etlicher Obrigkaiten allem müglichsten Fleiss nit haben mügen ausgereut werden. The question is asked: Why does the common man adhere to Anabaptism? The answer, somewhat evasive, blames the judges and juries as being too lenient, using the rack too little, allowing the Anabaptists to show the courage of their faith in public. Easing their punishment had done no good. One thing had become clear, namely, that terror did not terrify. In spite of no less than 600 executions (an official figure!) in 1527-39, the expected results were still lacking. The most efficient remedy, i.e., internal church reforms, did not occur to these ecclesiastics and magistrates, who simply wanted to bring these men back into the fold of the Roman Church with a minimum of effort. The king replied with new mandates advising the omission of doctrinal discussion at trials because they merely excited the interest of the public. The story of Anabaptism appears very different when looked at not from the outside, as the official records reflect it, but from the inside where the intrinsic issues are discussed and at stake. For this purpose other source material must be consulted—the writings and chronicles of the Anabaptists themselves. In few countries was the absolute seriousness of life's conduct and the commitment to the way of discipleship more eagerly sought after than in Tyrol. Hence few countries produced more and greater leaders than this Austrian province. Jakob Hutter and Hans Amon, Hans Mändl and Peter Walpot, Jeronimus Käls and Hans Kräl, were all outstanding leaders of the Hutterite movement both in Tyrol and Moravia. Marpeck and Scharnschlager were equally outstanding leaders of a related Anabaptist movement, different in many ways and yet of the same roots. These men did not produce great doctrinal treatises (except Marpeck and Scharnschlager), but their epistles and hymns written in prison, and their farewell words at the place of execution, recorded in the chronicles, as well as their written defenses before the courts (Urgichten), are moving witnesses to their spiritual depth and strength. There can be little doubt that Anabaptism took its start in the lower Inn Valley around Rattenberg and Schwaz, both mining cities. Even though the activities of both Schiemer and Schlaffer were but short-lived (1527-28), they left a profound impression which was still felt 50 or even 80 years later. The Kunstbuch of the Marpeck circle, dated 1561, contains their writings as do the numerous Hutterite codices of Moravia and Slovakia. They laid the groundwork, continuing Hans Hut's apostolate, and the Tiroleans remained loyal to it, even though Anabaptism arose independently in other places also, such as Kitzbühel, Brixen, Clausen, Pustertal, etc. The geographic situation—many valleys separated by high, snow-covered mountains—should have worked for independence and particularism; and yet Anabaptism was a fairly uniform movement based on the understanding of the pure Word of the New Testament and obedience to God's commandments (discipleship). Of all places Rattenberg had the highest number of martyrs: 71 by 1542. This is a graphic illustration of the staunchness of the brethren and sisters, in full awareness of the dangers involved. A second wave of new commitments is reported around 1558, due most likely to the work of Hans Mändl, and as late as 1603 Anabaptists were still passing through Rattenberg. Of Blaurock and his brief activities south of the Brenner Pass (1529) mention has already been made. But the movement which arose in the nearby Puster Valley and around the city of Bozen (Bolzano) was of more permanent consequence. Here Jörg Zaunring was active as early as 1528 in the "Ritten" district, and most likely also Jakob Hutter, who was born in the Puster Valley. From the Italian-Tirolean border in the south to Kufstein in the north, from the Eisack Valley on the Brenner road to Carinthia in the east, Hutter was active, a true apostle of the new teachings. He must have been an acknowledged leader by 1528-29, for the brotherhoods in the Puster and Eisack valleys decided to send him and Siegmund Schützinger to Moravia to inquire whether there was a chance there for a more stable brotherhood life. After a long conversation with Jakob Wideman in Austerlitz, Moravia, the two men returned hopefully, and now the first group of emigrants under the leadership of Zaunring went to Moravia. Other trips by Hutter followed in 1531 and 1533. The activities and the success of this man are truly amazing. When persecution (temporarily) became very acute also in Moravia, Hutter was urged to return to Tyrol (1535), where he was finally caught and cruelly martyred in February 1536. Also Hans Amon, bishop in Moravia 1535-42, had spent the years 1530-34 moving all over Tyrol. Persecution did not dishearten these people but only speeded the immigration to Moravia. Among these refugees were Jeronimus Käls, the schoolmaster of Kufstein, a most noble and dedicated representative of Anabaptism, executed in Vienna in 1536. Ulrich Stadler, though a Tirolean, did not become an active leader until his immigration to Moravia and thence to Poland (d. 1540). Both Onophrius Griesinger and Leonhard Lochmaier, upon whom Dr. Müller had vainly tried his persuasive arguments, were imprisoned in Brixen and there sealed their faith with their death. It is difficult to imagine the incredible hardships in the dungeons and prisons of that time. Georg Liebich, who lay in the Vellenburg near Innsbruck for two years (1540-41), experienced haunting visions which drove him nearly mad. Bats, rats, and other vermin made his "dark hole" almost unbearable. The same is told of Hans Kräl, who in 1557 was captured and thrown into a dungeon of the castle tower of Tauffers (Puster Valley): his clothing rotted from his body and he nearly perished in filth and vermin. In addition to all this, he spent not less than 37 weeks in the block. But he came out to become eventually one of the outstanding leaders of the brotherhood in Moravia, where he was bishop 1578-1583. One of the strongest personalities of the Tirolean Hutterites of the mid-16th century was Hans Mändl, born near Guffidaun in the Eisack Valley, whose activities extended from 1536 to his tragic end in 1561. He was won for the new faith by Griesinger and suffered imprisonment several times. He was one of the finest apostles Anabaptism ever produced, and accordingly his success was simply amazing. But in 1560 he and two fellow Anabaptists were caught in the Inn Valley. His trial and end are well described in the Hutterite chronicle, and his epistles are testimonies of the best Anabaptist spirit known. His readiness to suffer for the sake of his faith has few parallels in the annals of Anabaptism. One of the last martyrs to be executed in Tyrol was Nicholas Geyerspüchler, a miller from the neighborhood of Kitzbühel. Though illiterate (an exception; most Anabaptists from Tyrol could not only read and write but were extremely skillful in their epistles and other writings), he was most successful in his mission work throughout his home district, whither he had been sent by the Moravian brotherhood. In 1566 he, too, was caught, and after much work by Jesuits and his steadfast defense was first beheaded and then burned, in 1567. The great church reforms of that time no doubt had some effect, and Anabaptism outside Moravia gradually began to decline. Moreover, the milder regime of Emperor Maximilian II in 1564-76 soon brought these horrifying executions almost to a conclusion. Two more outstanding Tyroleans became Hutterite leaders, but no longer as apostles or missioners, but as bishops of a well-established brotherhood-church in Moravia. Peter Walpot, born 1521 near Klausen, where he had witnessed the death of Blaurock in 1529, seems to have immigrated to Moravia at an early age; in 1542 he was already a preacher, and in 1565-78 a very successful Vorsteher or bishop. He was succeeded by Hans Kräl (from Kitzbühel), who was bishop in 1578-83 and also continued the great Hutterite chronicle. His previous mission work in Tyrol had likewise been of unusual success, as the increasing stream of newcomers from Tyrol testifies. More martyrs were still to come, such as Andreas Pürchner (1584), Georg Wenger, and Jacob Platzer (1591), but in general Anabaptism in Tyrol had spent itself by the turn of the century. In the neighboring smaller provinces of Vorarlberg, west of Tyrol, which by and large played a minor role in this story, the last martyrs were executed in 1618. Loserth in his classical study of Tyrolean Anabaptism also collected some material pertaining to the methods of the missioners in their tireless and dangerous endeavor to reach the widest possible circles. One person deposed at court that he unexpectedly found a notice in his house inviting him to a meeting somewhere in the woods; another heard whispering in the bushes and upon approaching found a group of Anabaptists who brought him special information. Now and then a missioner approached someone who disliked his message, but rarely was he betrayed to the authorities. Many people were indifferent, but it often happened that a young girl or a man servant by chance picked up the words and eventually traveled to Moravia to learn more of that new teaching. When the "good time" set in in Moravia in the second half of the century, the arguments became even more attractive, and people were ready to sell their property and leave their old homes. That the main stock of Hutterites was Tyrolean was brought home recently also in an unexpected way: when in 1937 two American Hutterites revisited their old places in Europe, they discovered that their own German language was simply a Tyrolean dialect—and this in spite of the fact that they themselves were not of Tyrolean extraction. Ammann, Hartmann. "Die Wiedertäufer im Pustertal und deren Urgichten." Programm des Gymnasiums in Brixen. 1896-97. Beck, Josef and Johann Loserth. "Georg Blaurock und die Anfänge des Anabaptismus in Graubünden und Tirol." Vorträge und Aufsätze der Comenius-Gesellschaft VII. Berlin, 1899. Correll, Ernst. "Anabaptism in Tyrol, a Preview and Discussion." Mennonite Quarterly Review I (1927): 49-60. Dedic, Paul. "Literaturbericht über den österreichischen Protestantismus von 1918-38." Archiv für Reformationsgeschichte XXXV (1938): 252 ff. Dörr, Anton. Tiroler Volksgut auf dem Heidenboden. Eisenstadt, Austria, 1951, who found a miracle play among the Habaners of Burgenland, Austria, which originally was a Christmas play from the lower Inn Valley. Fast, Heinold. "Pilgrim Marbeck und das oberdeutsche Täufertum." in Archiv für Reformationsgeschichte XLVII (1956): 212-42, particularly 220 note. Fast, Heinold. Communismus. Innsbruck, 1951, 1952, (digests also the recent studies by Kolb, Mayer, Kuppelwieser, and Sinzinger). Fischer, Hans G. Jakob Huter, Leben, Frömmigkeit, Briefe. Newton, 1956. Friedmann, Robert. "Die Briefe der österreichischen Täufer." Archiv für Reformationsgeschichte XXIII: 30-80; bibliography for Tirol, etc., 161-87 ff. Hege, Christian and Christian Neff. Mennonitisches Lexikon, 4 vols. Frankfurt & Weierhof: Hege; Karlsruhe: Schneider, 1913-1967: v. IV, 332-340. Kirchmaier, Chronik des Stiftes Neustift bei Brixen, Fontes Rerum Austriacarum I. Vienna, 1854. Kolb, Franz. Die Wiedertäufer im Wipptal. Innsbruck, 1951. Kripp, Johann von. "Ein Beitrag zur Geschichte der Wiedertäufer in Tirol." Programm des Staatsgymnasiums zu Innsbruck. Innsbruck, 1897. Kuppelwieser, Karl. "Die Wiedertäufer im Eisacktal" (unpublished doctoral dissertation at the Univ. of Innsbruck, 1949). Sinzinger, Katharina. "Das Täufertum im Pustertal" (unpublished dissertation, Innsbruck, 1950). Widmoser, Eduard. "Das Tiroler Täufertum." Tiroler Heimat XV: 45-89; XVI: 103-28. Wolf, Adam. Geschichtsbilder aus Oesterreich I. Vienna, 1877. Loserth, Johann and Robert Friedmann. "Tyrol (Austria)." Global Anabaptist Mennonite Encyclopedia Online. 1959. Web. 20 Apr 2019. http://gameo.org/index.php?title=Tyrol_(Austria)&oldid=146298. Loserth, Johann and Robert Friedmann. (1959). Tyrol (Austria). Global Anabaptist Mennonite Encyclopedia Online. Retrieved 20 April 2019, from http://gameo.org/index.php?title=Tyrol_(Austria)&oldid=146298. Adapted by permission of Herald Press, Harrisonburg, Virginia, from Mennonite Encyclopedia, Vol. 4, pp. 724-728. All rights reserved.